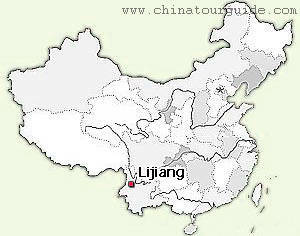 Located in the northwest part of Yunnan Province, Lijiang is composed of a new town and an old town. Most visitors traveling to Lijiang spend their time touring the vast spider-web of alleyways and shops in the old town, which was listed as a UNESCO World Heritage Site in 1998. The ancient Lijiang has no city walls, a peculiar feature much different from most towns in China 's dynastic period. 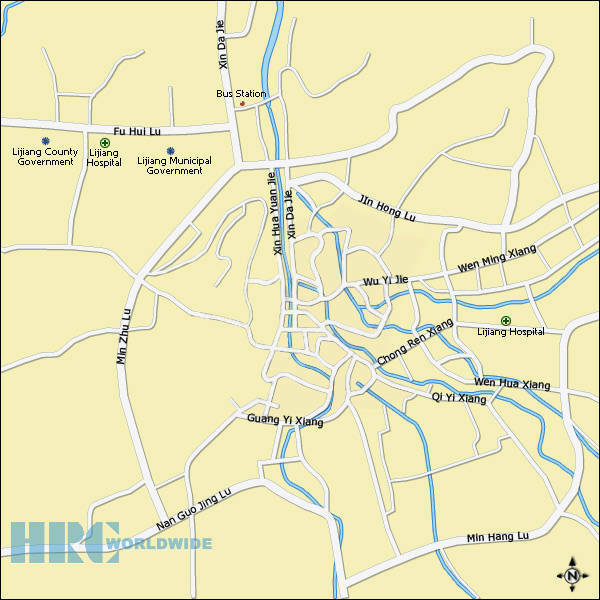 The Yuquan River splits into three main streams and numerous branching canals that criss-cross the town in every direction. It is a very calming scene expressed in the Chinese saying about Lijiang that "every house is surrounded by rivers and drooping poplars". The graceful combination of old-style architecture and arching crosswalks with the gently flowing water has contributed to Lijiang 's reputation as the "Suzhou of the Plateau" and "Oriental Venice". With its narrow winding alleyways and ancient Chinese architecture, Lijiang has managed to retain much of its historic charm and is one of the most popular tourist destinations in Southwest China. Several ethnic minorities have called the area their homeland for millennia and played a leading role in the area 's cultural development. These include the Naxi, Yi, and Bai peoples. The Naxi are a matriarchal society and are the subject of much interest among Chinese and foreign tourists. In addition to the historical and cultural attractions, the natural beauty in the area is hard to beat. Jade Dragon Snow Mountain is just a short ride from the city. It is the site of the southernmost glacier in the Northern Hemisphere. A lift can take tourists almost to the top of the mountain to see the glacier up close and catch a breathtaking panoramic view of the entire valley. The lift ride itself is well worth taking a field trip to the mountain. The old town of Lijiang has a unique culture and a storied history of over 800 years. Built and developed by the Naxi people, the town and surrounding region have been heavily influenced by their customs and way of life. Since their main source of livelihood has historically come from herding yaks, it has become their symbol. 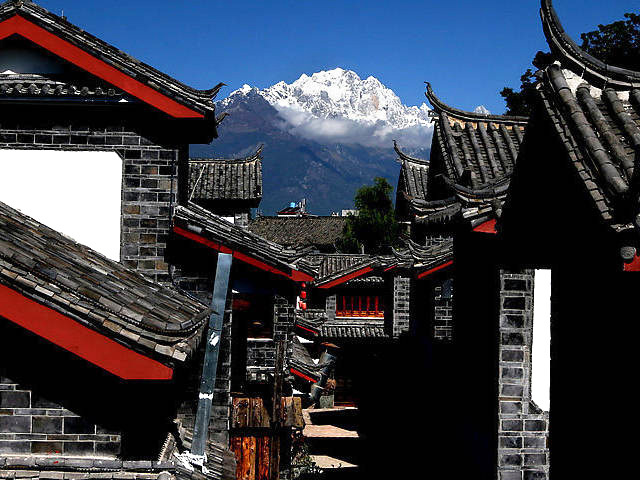 Lijiang reached its heyday during the Ming Dynasty when a large number of people from Anhui Province were forced to migrate to Lijiang in order to station and provide for the imperial military troops sent to the remote border area. The influence of these migrant workers is evident by the architectural styles employed after their arrival. 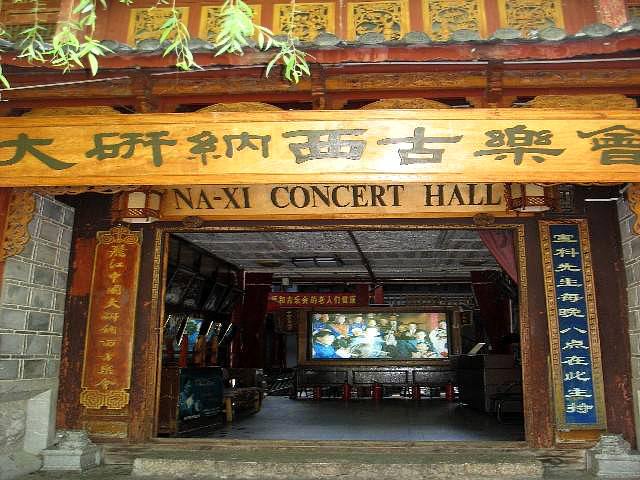 Now completely pure Naxi buildings only remain in the rural areas surrounding Lijiang City. Since Lijiang was trading post on the southern Silk Road and Tea-Horse Trading Route, it served as a go in-between for merchants from Yunnan and Tibet. This trade also contributed to the city 's growth and prosperity. There is no railway station in Lijiang (a line is now under construction from Dali to Lijiang and should be finished by 2010.) Some people take a train from Kunming to Dali and then transfer to Lijiang by bus. 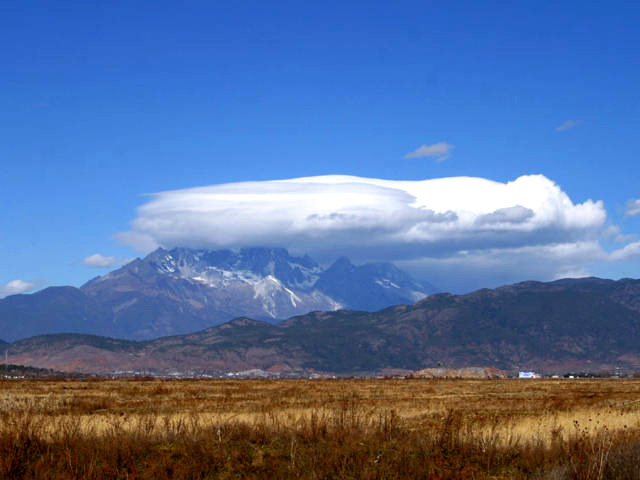 Lijiang Airport is located 28 kilometers (17.4 miles) south of Lijiang City. 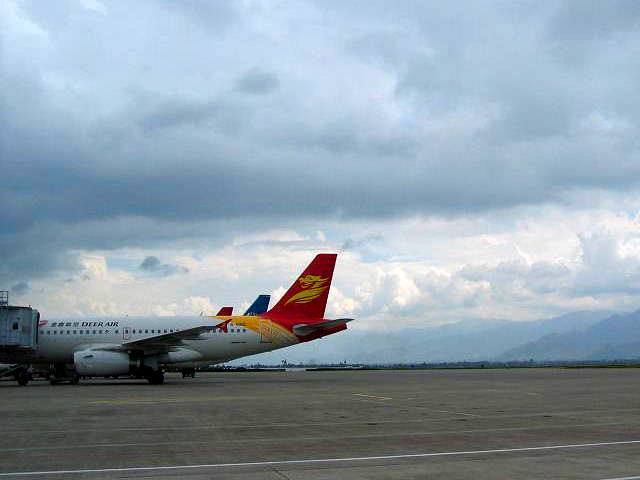 The airport is one of the busiest mid-sized airports in Yunnan Province. Currently, there are connections from Kunming, Xishuangbanna, Beijing, Shanghai, Guangzhou, Chengdu, Shenzhen and Guiyang. However, most visitors prefer to fly to Kunming first, and then connect to Lijiang by air or long-distance bus. The airport shuttle buses run between the airport and the city proper and cost about CNY15 per person. The bus journey takes about 40 minutes. You can also travel to downtown directly by taxi for about CNY80. 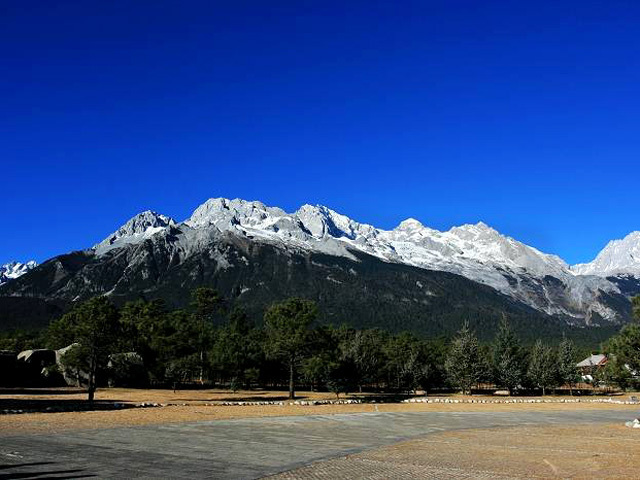 At present, the most popular way to reach Lijiang is by bus. Located near the crossroads of Yunnan, Sichuan, and Tibet, Lijiang has access to a good highway system extending in all directions, making it easy for visitors to travel between Lijiang and other tourist destinations of Yunnan Province, such as Kunming, Dali and Shangri-La. There are more than 10 bus lines running in Lijiang, connecting every corner of the new district, but vehicles are not allowed to enter the historic area. The ticket fare ranges from CNY0.5 to CNY1. Every morning, the No.7 bus departs from Hongtaiyang Square in the north of the Old Town to Jade Dragon Snow Mountain. The fare is about CNY15. Although it is not a large city in size or in population, Lijiang has about one thousand taxis. A small taxi is CNY6 for the first 3 kilometers (a1.86 miles) and then CNY1.6 for every additional kilometer (0.62 mile). Taxis are readily available for hire; most of the charter taxis gather near Mao Square early every morning. You can bargain on the price and time when you will be back and they will meet you promptly at the tourist spot. Bicycle is one of the best methods to go sight-seeing in the down town area. Some hotels have free bicycle rentals. If yours does not offer this, you can visit one of the small shops near Mao Square, which normally rent bikes for RMB7-10 per day. The popular attractions are scattered across Lijiang, so cars or buses are usually required if you want to take them all in. The local people offer trucks, tractors and horses, but be prepared for the bumpy mountain roads.